The Savage Frontier Pack is live on PC! It will launch on PS4 and Xbox One on the 17th of October. Experience all new content from the savage boundaries of civilization, where Pictish warriors summon brutal beasts to do their bidding. Build your settlement and fortress from the new Frontier set of building pieces, made to repel ruthless Pict raiders in the frontier lands of Aquilonia. Equip yourself with brand new Pictish armor sets, like the Pictish Wizard armor. Craft a set of new Pictish weapons, adorned with mystic runes, fur and the skulls of wild animals. Get five exclusive pet skins which can be used to change the appearance of animals tamed in the new pet system and adorn your body with new decorative warpaints. 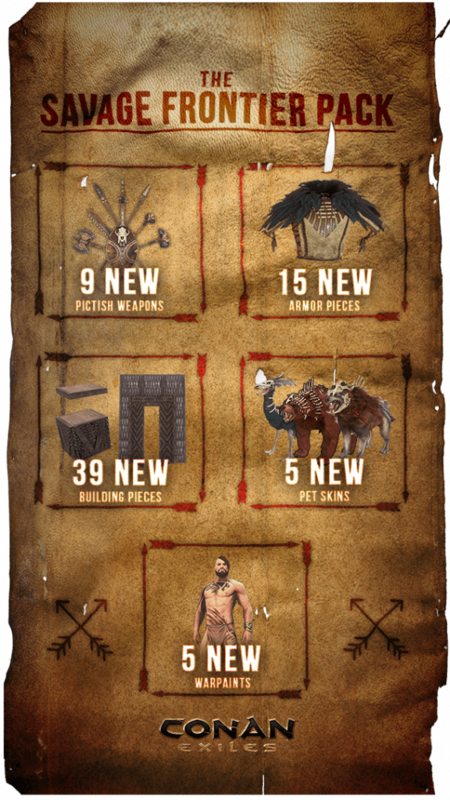 All the new content from The Savage Frontier Pack is exclusive to this DLC and adds a host of new visual options but does not give any in-game advantage in power. All the new items have comparable stats to existing items.